Most of my knowledge of Toby is from memory and sketchy at best.However if you wish to help out,please leave some information in the Guestbook and I will add it here.As far as I know,Toby only incorporated one other publication during its run-See Saw,in July of 1977(See "See Saw" :-).I don't know if Toby itself was later incorporated by another magazine and I don't know when it finally ceased as a publication.So,a lot of information is needed here.Please help if you can. In addition to the above,I would be interested in any information concerning the writers and artists of the stories,moreso from the people themselves,if they happen to notice this tribute site to the comic they worked on so long ago. Thanks to Al from Comics UK for that information. 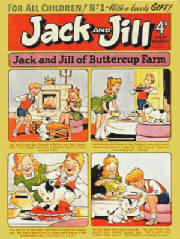 I was astounded to discover not one,not two but three former Toby stories seemed to not only escape the death throes of Jack and Jill but resurect themselves 4 years later in Rupert Weekly!If anybody has anymore information concerning this please contact me!Were they reprints or New Stories?The 3 stories were Grandma Next Door,The Little Prince and One Day When The Sun Was Shining. 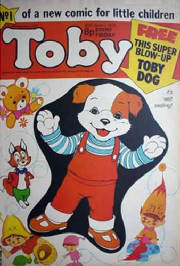 30th January marks the 30th Birthday of the launch of Toby. 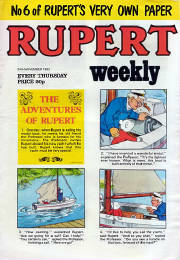 To start reading this and others go to the Issues page and click on the thumbnails.I'm also on the lookout for any and all merger issues with See Saw.Though not a merger Issue,I have put Issue 1 online for your reading pleasure.Simply click on the thumbnail below.Also Look and Learn have a brilliant website celebrating many younger reader comics from the past.Click on the thumbnail to go there now.Any information,just drop a note into the Guestbook.Talk to you soon.